High Bridge Shires is located in Sequim, WA. Skilled at fitting, repairing and making harness, John often helps teamsters with harness buying and fitting decisions. Having apprenticed for a decade with Ed Hewson, master wheelwright and wainwright, he is accomplished at building and restoring wagons, carriages and wheels. He also repairs and restores horse-drawn machinery. 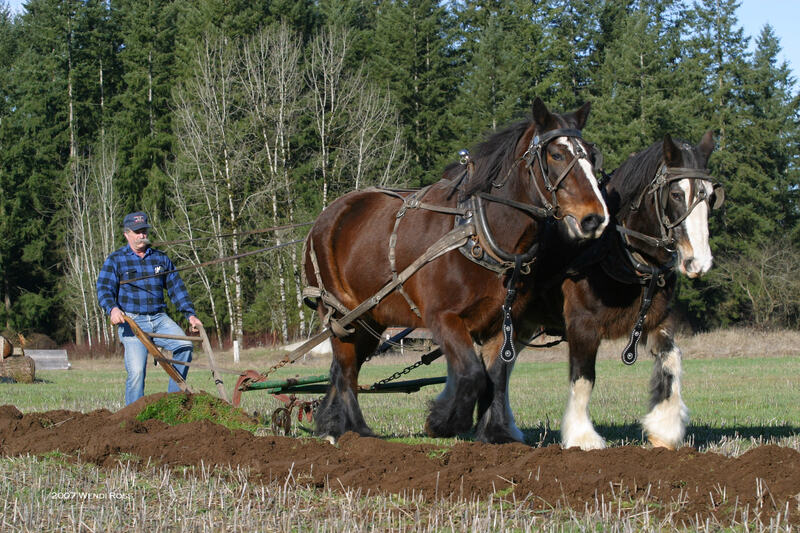 John has been a guest speaker at draft horse clinics and roundtables, and has judged various draft horse events. He has been featured in industry periodicals including Lynn Miller’s Small Farmer’s Journal, and The Heavy Horse Magazine, an English publication. John and his wife, Heather, farm 30 acres just west of Sequim, Washington. I’ve been farming with a horse for almost 20 years now and have taken clinics at other places. This past year I had the great opportunity to have John work with me and my young horses. Besides giving my new team an incredibly good start, he has helped me bring my driving skills and understanding of working with horses up several notches. Some of the most powerful lessons centered around my role and responsibility on how things worked out. This guy has a real wealth of knowledge to pass on!